The pivot came to the Warriors with the intention of making a good year, winning the ring and looking for a good contract for the future; a new injury complicates his plans. The future of DeMarcus Cousins hangs in the balance. At least that seems after the injury suffered in the opening minutes of the second game of the tie in which the Warriors faced the Clippers (game that ended up losing). The injury is another chapter in the career of a pivot that has been since his arrival in the NBA unquestionable talent, but that, for reasons or others, is always questioned. The pivot is contesting his ninth season in the NBA. After playing the first game of the tie against the Clippers (9 points and 9 rebounds), he finally took off the label of "the best player in history without a single playoff game played." It was not a vain label. he has been the leader of the Kings since joining the team in 2010 (5th place in the first round), but all the talent he showed was countered by a problematic reputation that has always haunted him - he never made it to the final stage in Sacramento. With his arrival at the Pelicans (he was transferred in 2017) a new chapter in his career was opened, the franchise was one of those teams of 'I want and I can not', a group that brought together talents like Rajon Rondo, Jrue Holiday, Anthony Davis and Cousins himself: Impressive players on the track and egos very difficult to handle When it seemed that the project was starting and his chemistry with Davis in the area became undeniable, the pivot injured the Achilles tendon and had to see how his team played the playoffs (and reached the semifinals of the conference) street dress. At the time of injury he signed the best basketball of his career: 25.2 points, 12.9 rebounds, 5.4 assists, 1.6 steals and 1.6 blocks. In 48 games. Impressive numbers before the worst injury of his sporting life. Following the summer, there was much speculation about his future. Before the incident could have opted for a maximum contract for more than 133 million, but this injury so serious, that has been ahead races like those of Kobe Bryant, caused that signing him for a large contract would become a risk for any team and a handicap for a professional who before suffering this injury could have been the franchise player of any template. Finally signed by the Warriors for the minimum and set a set that with him on track would form one of the most fearsome quintets in the recent history of the North American League. Apriority was not a bad decision. I would have the chance to play the playoffs at last and if everything went well I would end the season as an NBA champion. In addition, he would have time to show that he was recovered in a team where in the regular season he could enjoy minutes due to the management of the effort that is made towards the final phase, which is where these Warriors really compete. But finally things have not gone as expected. The pivot debuted on January 18 against the Clippers with 14 points, 6 rebounds and 3 assists. In the 30 matches he has played, he has averaged 16.3 + 8.2 + 3.6, a not insignificant number for a player who had been unemployed for almost a year and who was in a team where the collective game prevailed and where, Due to the accumulation of talents, I could not have as many shots as in the past. After the good sensations in his return, he lowered the level slightly and came to say that it was "frustrating" as the rivals exploited their defensive limitations. Green came out to defend him in a few weeks in which the chemistry of the team was questioned: "Our defense is crap with Cousins or without him" , said Draymond, thus exonerating the pivot of the group's defensive problems. Tras get the first place in the Western Conference and with the arrival of the playoffs, the Warriors have returned to get the mental balance necessary for the postseason, in addition to recover for the cause to Andrew Bogut and clear doubts about his game. 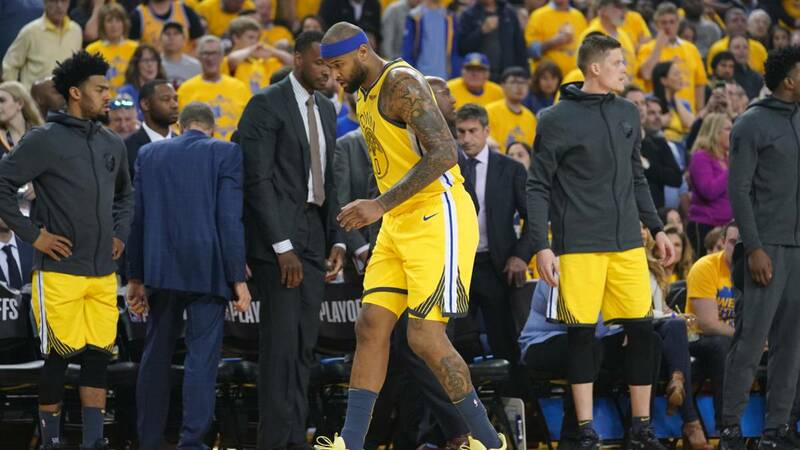 However, Cousins fell injured last night before the Clippers, and again his future hangs in the balance, although now with more concern than before. In Yahoo Sports has been speculated on a possible return in the Finals (in case the Warriors play them) but his performance in the current campaign, where he has only played 30 games and in which he has re-injured, makes him very difficult to return to opt for a big contract. Now we have to see what happens with the pivot. Last year, to see that there were not very long or very succulent offers, decided to head to the Bay, where you can take (play or not) a champion ring. Now, to the anti Cousins policy (which is no longer on the crest of the wave) is added a possible reputation of manCrystal for a player who has a hard injury to the quadriceps after coming out of one of the worst injuries to play basketball that exist. The Warriors will also have to decide what to do, and it seems that everything will depend on what Kevin Durant does. Will the forward go (to the Knicks?) could try to retain the pivot for the same salary as this year (5.3 million), and see how it evolves next year . Otherwise, they could even offer you a lower contract and see also what level it gives next year. DeMarcus is in a similar dilemma. He has not shown a bad level in the games he has played, but a new injury can leave him without guaranteed long contracts, and with only 28 years of age nothing is known of his future. Summer will solve his future, and we will see if the American player continues in the Warriors or he lands in some other team of the league. An uncertain future and full of doubts for one of the greatest talents the NBA has seen in recent years.